Spectacular Santa Cruz hike from Huaraz. Lakes, waterfalls, rivers, flora & fauna & local culture. Supported camping on most famous Cordillera Blanca trail. 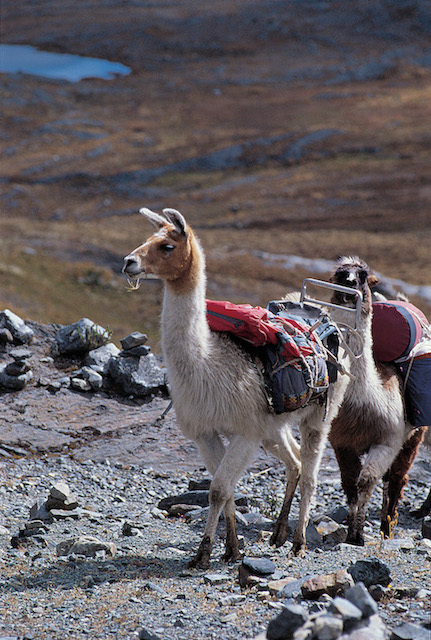 Hike the spectacular Santa Cruz trail from Huaraz. Fully-supported camping on most famous of all Cordillera Blanca treks. Two high mountain passes with fabulous views of peaks such as Alpamayo, Huascaran, Chopicalqui & Taulliraju. Lakes, waterfalls, rivers, combined with wide variety of flora & fauna, and local culture. Below prices are per person, based on two people sharing. *The 3-day Santa Cruz trek begins in Vaqueria, and ends in Cashapampa. It covers the same distance as the 4-day trek, and so is recommended for experienced hikers only. We pick you up from your hotel in Huaraz (3,100m / 10,170 ft) at 7am and transfer you to the trail start in Cashapampa (3,000m / 9,843ft). Mt. Huascaran, Peru’s highest peak. On the way we make some photo stops of the stunning mountains in the Huascaran National Park; and also visit the remains of the old village of Yungay, which was buried by a mud-avalanche in 1970. We will arrive in Cashapampa at approximately 10am, where we meet our donkey handlers. They will start loading the donkeys, while we get ready for our first day of hiking. Today we walk to Llamacoral (3,650m / 11,975ft) in approximately 4 - 5 hours, arriving at the campsite at about 2 - 3pm. By the time we arrive at the campsite our donkey drivers will have overtaken us - fast and strong as they are - and set up the campsite, where tea and a snack will be waiting for us. Duration: approx. 3.5 hours transport; 4 - 5 hours hiking. The second day of our trek we hike to Taullipampa (4,200m / 13,780ft). We start walking after having our breakfast and packing our belongings - usually between 8:30 and 9:30am. Almost immediately, we start walking past the lakes Ichi Cocha and Jatun Cocha. Walking on the trail right next to Jatun Cocha we will see a distant trail winding up towards the North into the Arhuaycocha Valley - which is today's side-trek to get the best views of Mount Alpamayo and Quitaraju. The uphill trail is not as bad as it looks and the gained altitude is not lost: continuing to Taullipampa is on nearly flat terrain! Arrival 3 - 4 PM. From Taullipampa we walk approximately 2 - 3 hours to reach the highest point of the whole trek: Punta Union at 4,750m (15,584ft). Needless to say, the views from here looking back into valley are spectacular. After taking pictures and a short break, we make our way down towards our next campsite at Cachinapampa (3,800m / 12,467ft), arriving at around 2 - 3 PM. Working llamas on the Santa Cruz trail. Today we hike to a small settlement called Vaqueria. On the way we will see many indigenous houses and people. Farm animals often cross our path .... and will claim the right of way! At about 11am we hop on board our private van in order to drive to Huaraz. On the way we make a couple of photo stops, such as at the Portachuelo de Llanganuco pass at 4,760m (15,617ft). Very pretty views overlooking the Llanganuco Valley with turquoise lakes and snow-capped 6,000m (20,000ft) mountains all around. Our services end at your Huaraz hotel (not included). Duration: approx. 2 - 3 hours hiking; 3.5 hours in vehicle. 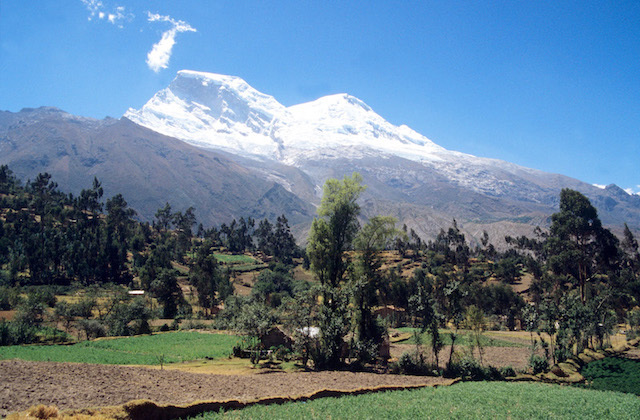 This morning, we pick you up from your accommodation in Huaraz (3,052 m / 10,013 ft) and drive to Caraz, then to the village of Cashapampa, located at 2,900 m (9,514 ft). Here we meet with our muleteer and the donkeys that will be carrying most of our equipment. We begin by walking up the Santa Cruz Valley, following the course of the river, to our first campsite at Llamacorral (3,750m / 12,303 ft). Walking time: 4 - 5 hours. After a hearty breakfast, we start walking up the valley, with splendid views of Santa Cruz Mountain (6,259m / 20,535 ft) to the north. The next mountain to come into view is Alpamayo (5,947m / 19,511 ft), which is considered one of the most beautiful in the world. We then walk past three stunning lakes Ichiccocha, Jatuncocha and Arhuaycocha, before arriving at our campsite at Taullipampa. From here we can see yet more high peaks, including Taulliraju, Paria, Artesonraju and Rinrijirca. Walking time: 6 - 7 hours. After breakfast, we begin the hike up to Punta Union Pass, at 4,750m (15,584 ft) the highest point we reach on foot. From here there are amazing views of the surrounding mountains. From the pass, we descend down the eastern side of the Cordillera Blanca, passing two small lakes, Collcacocha and Tzakicocha, before arriving at our next campsite at Paria. Our cook will be waiting for us with a welcome hot chocolate! After breakfast, we start walking down Huaripampa Valley, which is home to traditional Andean villages. We then walk uphill a short distance to the village of Vaqueria where we transfer our bags to a vehicle. We then drive across Portachuelo Pass, which is at 4,767m (15,639 ft). We stop here to take pictures, before continuing to our next campsite at Cebollapampa (3,950m / 12,959 ft). We start early in order to hike to beautiful Lake 69. We have lunch in the picturesque surroundings of the lake, and then hike back to Cebollapampa. From here, the rest of the journey is by vehicle, passing two more beautiful lakes - Chinancocha and Orconcocha - on our way back to Huaraz. Walking time: 5 – 6 hours. * 3 meals a day. NB. Vegetarian food available on request. * Porters or pack animals for camping equipment & food. * Cook & kitchen equipment. NB. In smaller groups, the guide cooks. * Transfer from/to Huaraz accommodation. * Breakfast on the first day and dinner on the last day. * Sleeping bag. NB. These are available for hire. The Santa Cruz trek was superb ... The weather was kind and I got lots of good photos, including from the road on the ‘traverse’ back with the support of guide and driver who were willing to stop on demand. Much appreciated. The guide deserves particular commendation as he was experienced, understanding and obliging in every way. And the camping kit and logistics was all very good, enabling me to focus on the photography.